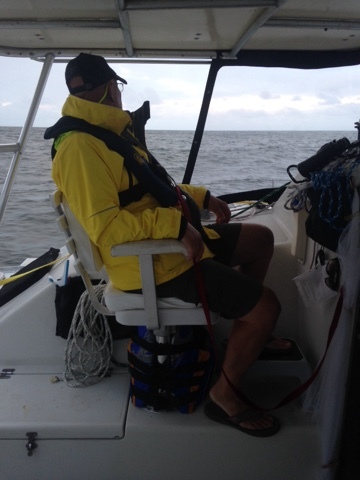 The Captain in his foul weather gear, shorts & flip flops. He never changed. We left Fernandina mooring field at 3:30 pm. I was feeling a little "eh". I'd had a small headache earlier, but tried to rehydrate. Neither one of us got an afternoon nap, but we'd slept late. We'd leisurely spent the day doing one last load of laundry, showered, brought bicycles back to the boat, and started securing things. I'd dug out layers (but didn't get them laid out). We had a late lunch/early dinner of The Captains signature stir fry with lots of ginger (no alcohol consumed!). The Captain assumed we'd be able to take naps inside in shifts. (He actually thought he could go up to our berth, while I hoped to lay in the salon.) We were aware that with our perfect 5-10 kts winds (add 5) and 2 ft seas (add 2) came with an almost new moon. 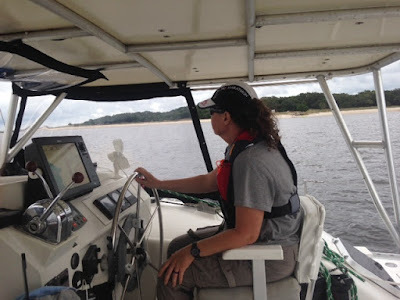 As we motored out, I realized that didn't matter, because it looked like an overcast evening. But I digress. We depart the mooring field at 3:30 pm with the First Mate at the helm (PFD's & tethers on). We had scheduled our arrival into St Augustine for sunrise, 7:30 am. 65 miles, at 4 (kts instead of 5 since we are planning to sail the majority) with an additional 30 minutes added in that would allow us to return to Fernandina before sunset, if we have any problems. The biggest problem was the First Mate scrambling to do dishes, make a carafe of coffee and organize snacks before we depart (another big mistake). We have running lights, similar to nav lights on an airplane. Otherwise, everything is pitch black. We have an overhead cockpit light we turn on for jibes (turns) and each of us has a small flashlight on a lanyard around our neck. We can see larger ships on our chartplotter with AIS (receive only) but it's hard to gauge distance. A friend asked if we had a big spotlight?! Yes, we do. We have a handheld that we can shine out on the water, or up onto our sails, to make us more visible, but mostly it's just dark. If a shrimp boat doesn't have his lights on or there is a floating container, we're screwed. In fact, this is exactly why The Captain likes being farther from shore (than I like). Fewer things to hit (just like airports). We arrive at the inlet, just as the sun begins to rise. Our Navionics chartplotter and iPad Garmin Bluechart disagree, but we both agree the red/green approach looks correct. The genoa is easily furled from the cockpit, and the main was dropped, but the Captain has to go up on deck to fasten the sail ties in the dark. He comes back and takes over the helm--"Just like a really long ILS." It turns out a few navigational bouys are out of position and/or unlit, but we had plenty of water underneath us. As we catch sight of the first mooring field, our initial destination, I advise the Captain that the bridge opens in 15 min. This is almost too much information for our tired minds, so I call the marina to see if there are mooring balls available on both sides of the bridge and (at this early hour) they confirm there are, "with a power boat off our dock scheduled through the bridge going the other way." I call the bridge and are advised to proceed to the 7:30 am opening. We can't believe our luck. Another call to the marina advises we're looking for "ball 53(?! ), next to Calypso. Be careful, it's shallow on the north, west and east side. Enter on the south end," (apparently he meant drive through the middle). Did you get all that Captain? "Calypso." We're tired and I start laughing. We're on the first try (ew, slimy!). After some high-fives and "yes, I am having a beer before I go to bed" and some frantic hatch opening and cat-feeding (wtf, Mom?) we crawl into bed. When I wake up at noon, I step out into the cockpit ("where are we?") and see Carina, a catamaran from dock 7 at Brunswick Landing Marina. Wait, what? It looks like a bomb went off on the boat. Boat hooks are laying on the foredeck, life vests are abandoned on the floor of the cockpit, binoculars laying up on deck. Layers of clothing strewn throughout the boat. Various, food/coffee cups/ginger beer bottles abandoned where they landed. We finally begin to clean up, the Captain securing the mainsail & cover & coiling lines, while I drop the dinghy in the water. After checking in at the marina, we stumble into the nearest pub (A1A Ale House, which happens to be right across the street). After I chatted up our waitress, the Captain looks at me and said, "It's Monday at 3:00 o'clock? That's brand-new information." Bloody Mary, please. There doesn't appear to be a train or paper mill here, but we do get to hear the draw bridge raise twice an hour. It's the idyllic Florida waterfront, with stucco and tile-roofed mansions & private docks lining the water way. We've been awestruck by the Naval (ie. submarine!) and Coast Guard presence on the East coast. From the Chesapeake, which appears to be one large military training ground, to the Norfolk (biggest naval port in the US) through the Dismal Swamp (Blackhawks on patrol and 3 military bases), each Coast Guard patrol boat has 4-6 people, sometimes with 2 gunners. We counted 6-$100,000 boats with government employees in polo shirts (4 per boat) departing Fernandina, on what looked like a training exercise. Two Homeland Security power boats just roared through the mooring field in St Augustine. We're not in Missouri, Toto. Future lessons: Coffee & tea was just adding acid to upset stomaches so next time we'll try 5-hour energy drinks for him, Starbucks Refreshers for me (max caffeine, minimum urinating), and a thermos of ginger tea. Snacks will be ginger candy and saltines instead of trail mix, sandwiches or leftovers. My problem was mostly an upset stomach which was abated with ginger candy and distractions (99 bottles of beer on the wall) so hopefully a full moon/clear skies would help. EVERYTHING will be stowed in cockpit including layers, snacks, drinks, and chargers for electronics so there is no reason to go below. The boss will try taking medication 24 hours in advance so it will build up in his system (I keep meaning to try some on a day we're not sailing, but I don't like the side effects). Thanks to everyone who followed along and kept us company on Facebook & Twitter. STATS: (The chartplotter dumped the portion of the trip before midnight so these are guesstimates) Total time 16:00 hrs, total mileage 65+ nm, sailed with reefed main & partial genoa--motored 1:30. We always put on a scopalomine patch 12 hours before leaving. We don't do it anymore because we're pretty acclimated but we couldn't make it without in the beginning. Congrats!! Glad you have another notch on your belts. Stay well.